Which Daly Did You Grow Up With? With both World War II and the Great Depression behind us, Bill Ihlenfeldt opened his first drive-in restaurant. It was the summer of 1948. 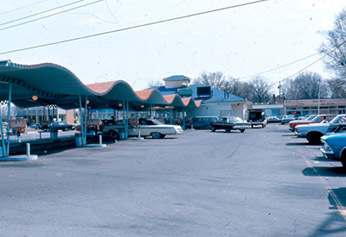 Located on what was then Jim Daly Road, it was called Bill's Drive In. Shortly thereafter, he renamed it Daly Drive In, after it's street location. Long hours and hard work were in his blood. Bill developed a special way of cooking hamburgers, and then topped them off with his unique Daly E-Sauce. Add in footlong Dalydogs, a variety of sandwiches, delicious soups and chilis, banana splits and other desserts, and you have his recipe for success. That recipe hassatisfied metropolitan Detroit appetites for over 50 years. 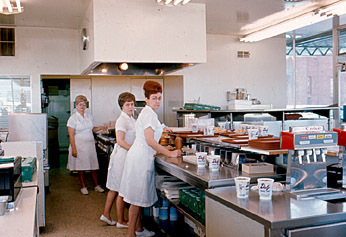 In the decade of the Fifties, Bill's brother, two sisters, and their spouses opened their own Daly Drive Ins. 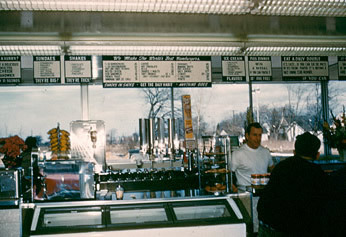 Located in Westland, Detroit and Livonia, they became the framework of a small chain that would become known throughout the country. Our restaurant is located on Plymouth Road in Livonia. This location was opened by Bud and Doris Grace in March of 1959. It is now company owned and operated.